A 2010 report by the Institute of Medicine and the National Research Council entitled Enhancing Food Safety: The Role of the Food and Drug Administration states that the FDA ‘lacks the vision’ and resources to protect consumers from unsafe food and foodborne illness. The report calls for more proactive instead of reactive measures, and asks the FDA to focus on more wide-spread measures to protect the food supply rather than trying to take cases on one by one. While senate leaders look at bills that would allow the FDA to recall peanuts or raw cookie dough that were making people sick recently, or to take action in accordance with the recent discovery of salmonella in alfalfa sprouts, these are not significantly importnat, and political leaders continue to completely overlook the obvious dangers of GMO crops. In an earlier article here on NaturalSociety, Anthony Gucciardi reveals just 4 ways the FDA doesn’t care about your health, from allowing dangerous ingredients in the food supply to supporting dangerous GMOs and the companies who produce them. Needless to say, the FDA has much more to answer for than that. 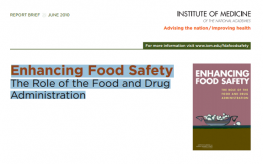 It is probable that the FDA needs to overhaul its entire organization, since it is currently in charge of more than 150,000 food facilities, over a million restaurants, another two million farms, and in total, about 80% of the nation’s food supply. The Agriculture Department oversees the safety of meat, poultry and some egg products. At least 15 government agencies have a hand in making sure food is safe under at least 30 different laws, some of which date back to the early 1900s. The report did suggest a more positive step in the meantime, though, recommending a centralized, independent “risk-based analysis and data management center” free from political, corporate, and scientific institutions that might alter the results of food safety tests in alignment with the companies that are paying them for their ‘scientific’ testimony. Ptsherm – you are 100% correct. They may as well be called the PUBLIC RELATIONS office for Big Pharma and Big Ag.